Concept: Help online shoppers get ready to jet off and travel on their own time with this appropriately named specialty online boutique created by Pure-Ecommerce - Welcome to OnMyTimeTravel.com! Travelers everywhere will want to shop here to find everything they need to travel to their bucket-list destinations. They can "get there in style" with the fabulous collection of luggage offered here. Plus, online shoppers can "focus on comfort" as they shop at this user-friendly website to find their travel must-haves. 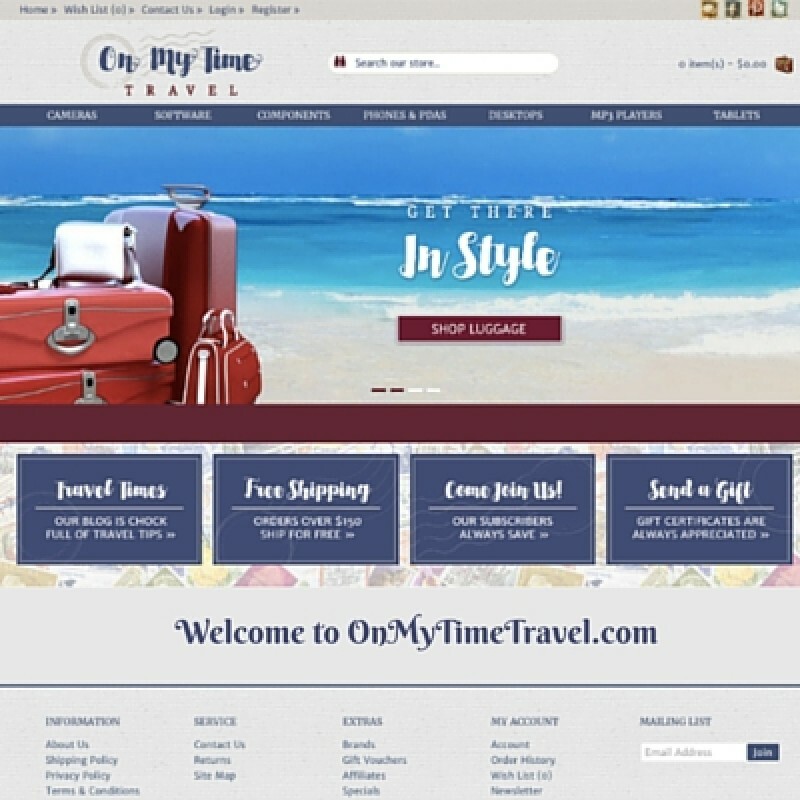 As the owner of this ready-made website, you can share tips, tricks and ideas to plan the perfect getaway through the connected social media pages, blog, and newsletter. It's a great way to connect with your customers and build lasting relationships! As the owner of this site, you will have freedom and flexibility to run your business on your schedule and from any location as all the products featured on this website are drop shipped to your customers directly from the vendors! You will also love the outstanding features of this 100% responsive design website. From the beautiful, eye-catching design, easy to navigate categories, captivating marketing messages, plus much more to draw customers into this online store. New to ecommerce - no problem! We have lots to offer you including our 10 step instructional program, 40 hours of ecommerce consulting and access to our eLearning library. Our internet businesses in a box are designed to give you the knowledge you need to help you get started in the world of ecommerce. Want even more? Be sure to check out our Platinum Package as we have lots of terrific extras to offer you! Did you know the luggage industry is forecasted to generate reach 67.8 billion U.S. dollars by 2020? This website business is a great opportunity for you to enter this flourishing niche market! Take the first step today - Inquire now and we will send you our pricing and information package for you to review. According to the U.S. Travel Association, direct spending by resident and international travelers in the U.S. averaged $2.6 billion a day, $108.1 million an hour, $1.8 million a minute and $30,033 a second. Global market is projected to display a steady growth rate represented by a CAGR of 6.03% during 2017-2022, chiefly driven by increasing spending on leisure and business travel worldwide. The Smart Luggage market is expected to reach $2,353.2 million by 2022, growing at a CAGR of around 26.4%. The luggage industry is witnessing innovation driven by the addition of tracking system, automated locking, and Bluetooth features creating a niche smart luggage market.